This past week I attempted my first unit using standards based grading. Letting SBG be the driving force of my class was one of my new year’s resolutions. I got much of my inspiration from Frank Noschese, Jonathon Claydon, Jason Buell, Shawn Cornally, Michael Ziloto and many other teachers I have met in person and virtually met online. My motto the first time around was to keep it simple. So I did. Here’s my approach. Before I thought about SBG, I always broke down my units into distinct concepts using standards. So nothing new here. Next, to help simplify things, I decided to give two smaller exams covering 3-4 concepts instead of one larger exam that would have covered 7 concepts. For free response questions, this is pretty straight forward. For multiple choice questions, I decided to go with 1 for an incorrect response and 3 for a correct response. There will be at least two questions for each concept and I will average the scores earned. This will provide a final measure that determines their level of understanding for each concept. My biggest issue was deciding how in the world I was going to keep track of all this. Whatever method I finally land on must be sustainable and practical. Well here’s my system as of now. As I grade the exams, I enter each student’s score for each question into a spreadsheet. (We luckily have a scanner that does this for multiple choice questions.) There’s only 3-4 free response questions, so its not terrible. I have the spreadsheet compute the averages and spit out a final score for every student on each concept. The spreadsheet will serve as my tracking system for each student towards mastery of all the concepts we learn. Now for student ownership of their knowledge. When I hand an exam back, I’ve always provided each one of my students with an individualized report that summarizes their performance. Before, the report contained their overall score, the class average score, etc. Now the focus is on what they actually understand (or don’t understand). 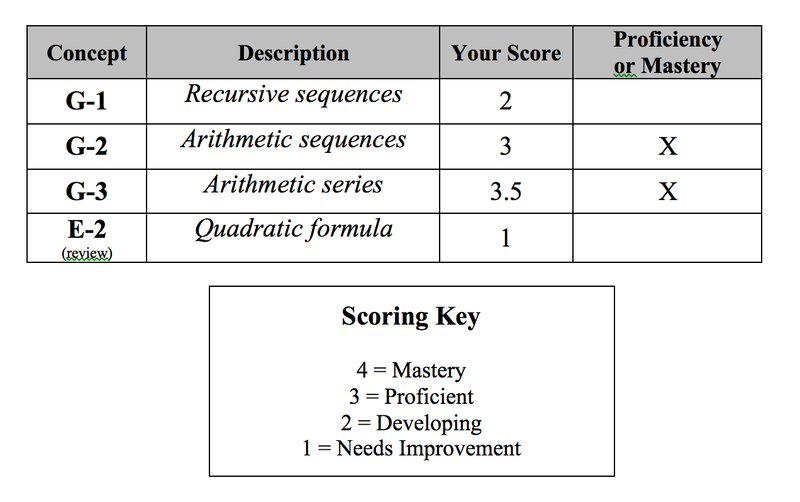 For SBG I use a simple mail merge to print out a report for each student stating which concept(s) they achieved proficiency/mastery on and which one(s) they need to reassess on. My next step, which will be a doozy, will be to decide how to maintain and organize my reassessment system. I know I will assign Friday as the one day that will serve as a “Retake Day.” This will be the only day where students are permitted to retake the concepts they need. This will help me stay sane and keep organized. Also, I need to get in the habit of creating retake material for each concept. Of course this is a work in progress. I’m just glad one of my resolutions is coming to fruition. This entry was posted in assessment, philosophy, strategy and tagged exam, new, old, sbg by brian. Bookmark the permalink.